#GenXYZ how do you normally start your day? Quick morning workout? Or a big hearty breakfast? The team here at XYZ loves nothing more than to start our day off with a nice cup of coffee. With coffee shops on every corner and thousands of brands to choose from, it can be hard to establish your place in such a booming business. So how does this week’s #WebsiteWednesday manage to stick out? (Besides the .xyz domain of course!) Type-A.xyz is breaking the mold with their own take on cold brew, delivered right to your home or business. Type-A.xyz is located in Manila, Phillipines and is a cold brew subscription service. Their cool and functional bottle design is what gets customers interested, but the great taste is what keeps them subscribed. Their coffee is single origin from Panama, and the low-extract process creates a light flavor with hints of fruit. But what really makes Type-A.xyz shine is it’s brilliantly designed bottle. The outside is marked with serving measurements, so you know exactly how much to pour. Simply pour 1 measurement of the bottle with an even amount of your favorite addition, such as creamer or milk, and add ice. Fast and simple for any morning, and an easy solution for that afternoon pick me up. “We are fans of specialty coffee but admit that there are days when making a hand brew from scratch is just too much work. With Type A, a cold brew made from 100% Panama beans, we wanted to develop an instant specialty coffee that retains all the nuanced tasting notes of a crafted coffee (ours are dark chocolate and orange peel) – just add water. We want Type A to be synonymous with cold brew coffee, and grow a community of A-types who love the brand. In fact, we’ve started a blog (type-a-intel.xyz) to talk to them about everything from recipes involving Type A to essays about things that would interest overachievers, say, how to deal when your dog has OCD. We love seeing the #GenXYZ continue to be at the forefront of innovation. From custom 3D printing, to functional and fun community living spaces, to A.I. text unscramblers, we’re always proud to provide a domain as unique as you are. 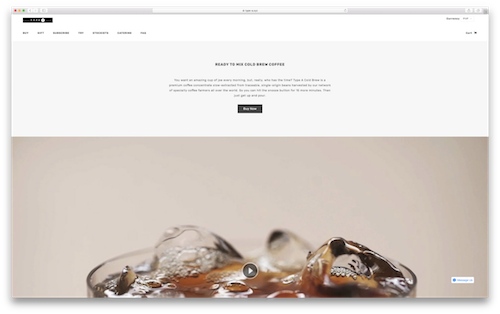 If you’re ready to get some of Type-A.xyz’s cold brew for yourself, you can subscribe here. You can also follow them on Facebook or Instagram to get the latest updates. Do you think you have the next great idea? Then lock down YourIdea.xyz now, and keep changing the world! « Previous Post Win a Nintendo Switch, a Quadcopter Camera Drone, or a bag of PublicSpace.xyz swag in our SXSW Scavenger Hunt! Next Post » Mobile First: What is it and why does it matter?